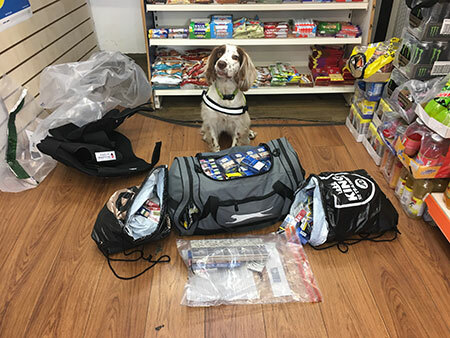 Cheshire West and Chester Council’s Trading Standards officers enlisted the help of two four-legged friends in the fight against traders selling counterfeit or contraband tobacco. 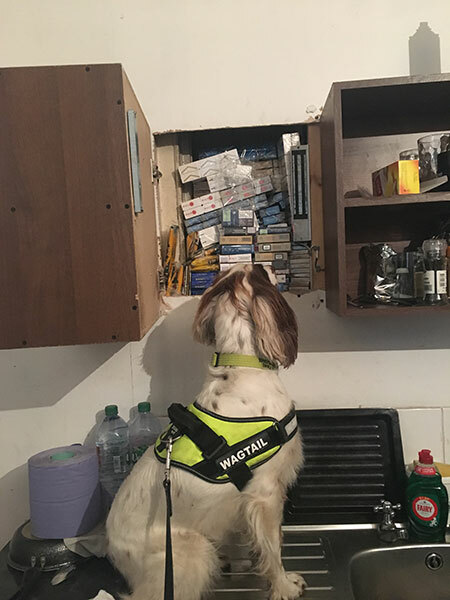 In the last week tobacco detection dogs Willow and Ted sniffed out a large haul of cigarettes and tobacco that was subsequently seized by Trading Standards. The illicit products were seized during raids carried out by Trading Standards officers, who are part of the Council’s Regulatory Services Team, working alongside Cheshire Police. The two dogs, provided by Wagtail UK Ltd, helped detect concealed stashes of tobacco in two of the premises searched, in Chester and Northwich. The tobacco was discovered in cavities in the wall that were hidden behind a cupboard and mirror with an electronic magnet system securing the entry point. Seizures included cigarettes and tobacco that were not in standardised packaging and failed to contain health warnings in English. These products cannot be legally sold in the UK. Councillor Karen Shore, Cabinet Member for Environment and Community, said: “Tobacco detection dogs have become valued members of our Regulatory Services team. “People may be tempted by the cheap price tag, but it's worth considering the great cost to your health, safety and community. Illegal tobacco supports other criminal activity and has many damaging effects on our local communities, as well as causing poor health. Anyone with information about the sale of illegal tobacco can pass the details on to Trading Standards confidentially through Citizens Advice Consumer Service on: 03454 040506, or alternatively anonymously call the Tackling Illegal Tobacco hotline on 0300 999 0000 or report online at www.keep-it-out.co.uk.